Our guide to San Francisco will help you find the best vegetarian restaurants in San Francisco California. San Francisco makes it wonderfully easy to tap into the Good Life. Between the hot arts scene, the tempting boutiques, the awesome bay views, and all those stellar, locally focused restaurants and wine bars, it's the perfect place to indulge yourself. There are tons of great vegetarian restaurants in the city of San Francisco, our city guide will help you find the best vegetarian restaurants. You may have a hard time deciding what to do in San Francisco, but we make your decision easy. The City by the Bay is yet another amazing vegetarian-friendly city on the Westcoast and is home to some of the best organic vegetarian restaurants in America. 1307 Sutter St, (415) 771-2142 - Wok Shop Cafe is a vegetarian restaurant located in San Francisco CA. 1365 Stockton St, (415) 362-2199 - Loving Hut is a vegetarian restaurant located in San Francisco CA. 1700 Fillmore St, (415) 441-3672 - Dosa is a vegetarian restaurant located in San Francisco CA. 1730 Polk St, (415) 775-4777 - Thai Spice Restaurant is a vegetarian restaurant located in San Francisco CA. 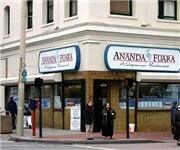 1972 Lombard St, (415) 923-1052 - Alive Restaurant is a vegetarian restaurant located in San Francisco CA. 200 6th Ave, (408) 294-2694 - Karma To Go is a vegetarian restaurant located in San Francisco CA. 2026 Irving St, (415) 731-2548 - Shangri-La Chinese Vegetarian is a vegetarian restaurant located in San Francisco CA. 2030 Lombard St, (415) 440-1505 - Mas Sake Restaurant is a vegetarian restaurant located in San Francisco CA. 2154 Mission St, (415) 864-1888 - Minako Organic Japanese Restaurant is a vegetarian restaurant located in San Francisco CA. 2193 Mission St, (415) 863-4744 - Weird Fish is a vegetarian restaurant located in San Francisco CA. 2235 Fillmore St, (415) 346-3477 - Ten-Ichi Restaurant is a vegetarian restaurant located in San Francisco CA. 2295 Market St, (415) 621-4434 - Bagdad Cafe is a vegetarian restaurant located in San Francisco CA. 2327 Polk St, (415) 928-4977 - Aux Delices Vietnamese Restaurant is a vegetarian restaurant located in San Francisco CA. 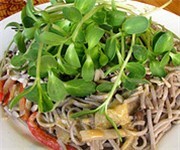 2400 Harrison St, (415) 824-4652 - Cafe Gratitude is a vegetarian restaurant located in San Francisco CA. 309 Clement St, (415) 387-2147 - Burma Super Star Restaurant is a vegetarian restaurant located in San Francisco CA. 3409 24th St, (415) 970-8815 - Papalote Mexican Grill is a vegetarian restaurant located in San Francisco CA. 350 11th St, (415) 503-1294 - Crepes A Go Go is a vegetarian restaurant located in San Francisco CA. 450 Broadway, (415) 434-4444 - Usual Suspects Cafe is a vegetarian restaurant located in San Francisco CA. 4591 Mission St, (415) 333-0604 - La Taqueria Menudo is a vegetarian restaurant located in San Francisco CA. 531 Divisadero St, (415) 885-7133 - Herbivore the Earthly Grill is a vegetarian restaurant located in San Francisco CA. 572 Ofarrell St, (415) 673-3136 - Golden Era Vegetarian Rest is a vegetarian restaurant located in San Francisco CA. 598 Valencia St, (415) 431-3351 - El Toro Taqueria is a vegetarian restaurant located in San Francisco CA. 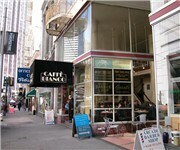 39 Sutter St, (415) 421-2091 - Caffe Bianco is a vegetarian coffeeshop / cafe located in San Francisco CA. 3906 Judah St, (415) 665-8423 - Judahlicious is a vegetarian juice / smoothy store located in San Francisco CA. 475 Sansome St, (415) 591-0555 - Vegetarian Times is a vegetarian located in San Francisco CA. 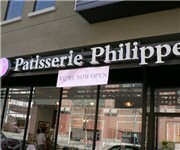 655 Townsend St, (415) 558-8016 - Patisserie Philippe is a vegetarian bakery located in San Francisco CA. There are plenty more vegetarian restaurants in San Francisco. See all vegetarian restaurants in San Francisco California.